The registration code will be picked up automatically in this page; if not (not likely to happen), this must be inputted manually. 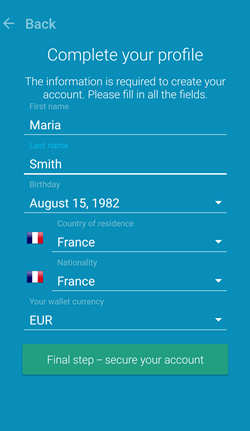 In the next step, enter your profile details: first name, last name, birthday (you must be at least 18 years of age), country of residence, nationality and your wallet currency (this is the currency of your account); the following currencies are available: CHF, EUR, GBP, PLN, USD and ZAR. The currency of your wallet can never be changed afterwards. 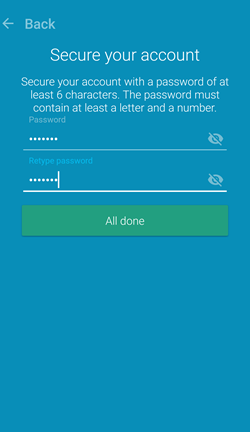 Next you will be asked to create a password for your account. It must contain at least 6 characters, out of which at least one number and one letter. After this, you will become a registered user. 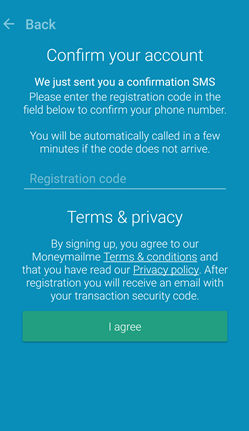 In order to become a validated user, for your own security, go to the inbox of the provided email address and in the email received as a welcome to the Moneymailme community, click on the button Confirm email address. That’s it, your account is created and valid, and you have a virtual wallet in the currency you have chosen! Note: the same welcome email contains a security code; you will use this to authorise transactions done on your wallet. 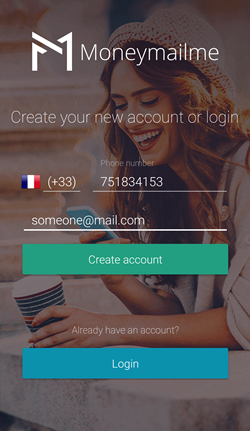 Note: Once a mobile account is created, an associated web page account is created, accessible at account.moneymailme.com with your phone number and password.